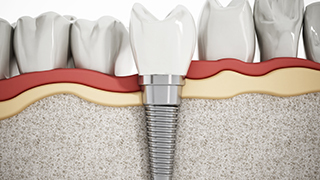 With a success rate of over 95%, dental implants are the leading option in tooth replacement today. If you have questions about this popular restorative treatment, we’ve got answers! 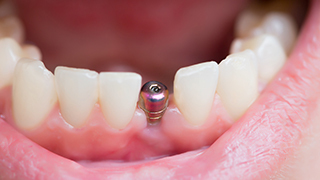 Keep reading for the handy dental implant FAQ. If doubts remain, please don’t hesitate to get in touch with our office to discuss everything you need to know about dental implants. A: A dental implant takes the place of a missing tooth’s supportive root. Each implant post is placed into the area where the root structure was. Here, the jaw bone grows around the implant post to provide a sturdy foundation for the replacement tooth/teeth that are placed on top. A: Most dental implants are made of titanium, a biocompatible material that your body accepts without issue. In some cases, patients with metal allergies or sensitivities may require ceramic or zirconia dental implants. These materials promote the growth of bone tissue to help the jaw bone fuse together with each implant post. A: Dental implants can be used to replace anywhere from a single missing tooth to an entire arch of lost teeth in the upper or lower jaw. Implant posts can support a single dental crown, a dental bridge, or a complete denture. A: The entire process for dental implants can take from six months to a year. It is completed in two phases: implantation and restoration. You may wear a temporary tooth replacement in the time between. A: The cost of dental implants depends on a few factors. You will need to schedule a consultation with your implant dentist to find out just how much you can expect yours to cost. The total price depends on how many teeth you are missing, where they are located in the jaw, and whether or not you need to have a preparatory procedure performed first. 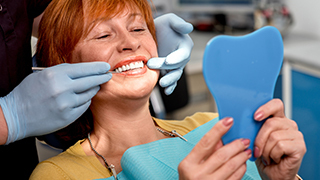 Dental insurance usually does not cover the cost of dental implants. A: Eligible candidates for dental implants are people who are in good oral and overall health. The only way to know for sure whether or not this is a great option for your smile is to schedule a consultation with Ridgepointe Dental! We can’t wait to help you enjoy all the benefits of a beautiful, complete set of teeth.